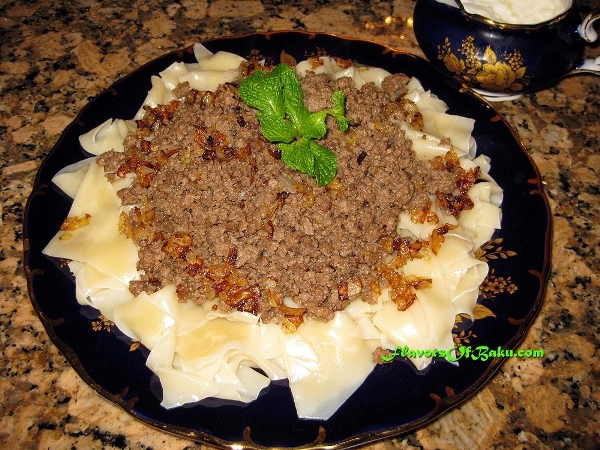 There are two types of Khingal dishes in Azerbaijani cuisine – Sulu Khingal and Guru Khingal. Both of them are made with lamb meat, homemade diamond-shape noodles, and fried onion. The difference between them is that Sulu Khingal is served with lamb broth and chickpeas, which are cooked together with the lamb pieces, and Guru Khingal is served with fried ground meat. Sift the flour into a bowl. Add the egg, salt, and water and start kneading the dough until it is stiff and elastic. Shape the dough into a ball, wrap it with plastic wrap, and set it aside for 20-30 minutes to rest before rolling. Dust your working area with flour and start rolling the dough out into a large thin layer 1-2 mm thick. 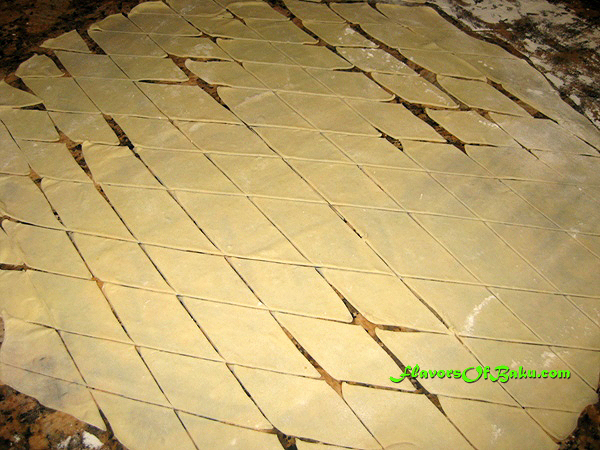 Then, cut the dough into diamond-shaped pieces and let them to dry before cooking. If your working area is made of plastic or stone, you can move them to a wooden cutting board so that they dry out more quickly and won’t stick to the surface. Preparing the meat and onion. 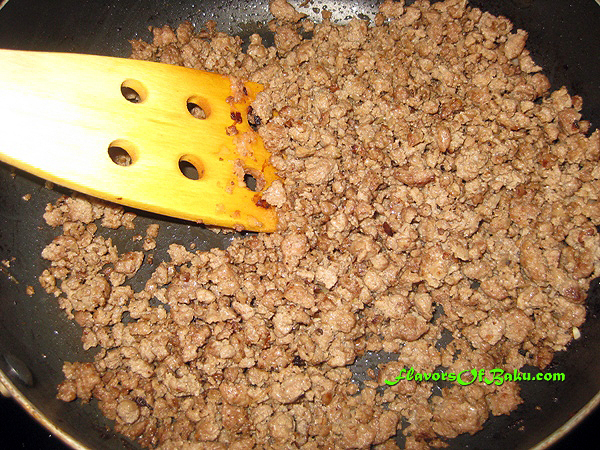 Cook the ground meat on a skillet over medium heat. Stir continuously until it is well done. Add some butter if the meat is too lean. After the meat is done cooking, add salt and pepper to taste. 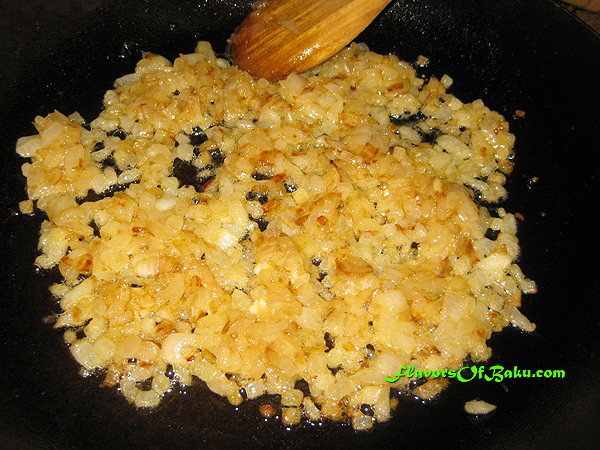 Chop the onion into small pieces and fry in clarified butter until golden brown. The diamond-shaped noodles should be cooked right before serving. Place them into salted, boiling water and stir with a spoon so they don’t stick together. Then, lower the heat and cook for five minutes until the dough is tender. Remove the noodles from the water with a skimmer, place them on individual serving plates, and pour hot, melted butter on them. 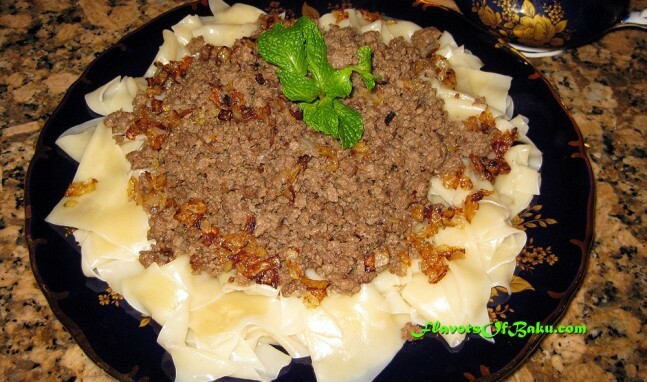 Place the fried meat and onions on top and serve with yogurt-garlic sauce.